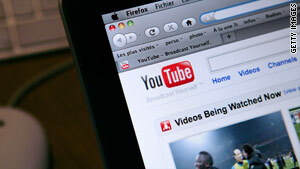 YouTube is trying to find ways for people who upload Web videos to make money. (MASHABLE) -- YouTube's movie rental service is still in its infancy, and it still only offers a small selection of films, but that could change quickly. YouTube exec Hunter Walk told MediaPost that the site will soon offer its users the ability to charge rental fees for their uploaded videos. For the past couple of years YouTube has been focusing on ways for its users to monetize their videos should they become very popular. It launched the YouTube Partnership Program last year, which allows some folks with popular videos (YouTube staff decide which ones are eligible) to share advertising revenue with Google. However, this new self-service rental plan will be the first opportunity YouTube users have to make money off of their videos by charging viewers instead of relying on advertising. Details on the program are scarce -- for example, we're not sure if just any user can partake, or if the program is only available to industry professionals. Admittedly, "industry professional" is a difficult term to define in the frontier of web video, which sees content from established companies competing directly with randomly viral videos from unexpected sources.